What is a Satellite Camp? View Camp Options Why MEB? check Emphasis on Perimeter, Post, and Point Play. check Focus on communication and become better leaders. check Free MEB silicone gel band. 4 hour camp day with 30 min break. add_circle_outlineJumpshot Analysis: Video & critique of each campers jump shot. add_circle_outlineResources: Free access to social media accounts, for weekly drills and skills to work on throughout the year. 4 hour camp days for boys program, 4 hour camp days for girls program. Includes 30 minute break in each camp. 2 hour camp days for boys program, 2 hour camp days for girls program. Includes 30 minute break in each camp. Add on to any 2 or 3 day camp. We help build love and excitement for the game of basketball while advancing fundamentals. Why choose an MEB satellite camp? 1 MEB camps cut out travel, lodging and road meal expenses. WE COME TO YOUR SCHOOL! 2 MEB camps develops individuals AND teams. Athletes not only advance individually through college-style player development, they also become better communicators, leaders and teammates. Athletes advance their individual and team skills with the same athletes they will play with in the winter…their high school teammates! 3 MEB camps improve your best players, your role players, and your younger athletes. This is more beneficial than just a few of your top athletes traveling a distance to attend a camp at a college or university. 4 MEB’s college coaches specialize in player development. Other camps over-charge, have campers stand in long lines, and play games a majority of the camp. MEB camps are reasonably priced for all athletes and the camp is not a PR event, it's a skill development academy in YOUR gym! 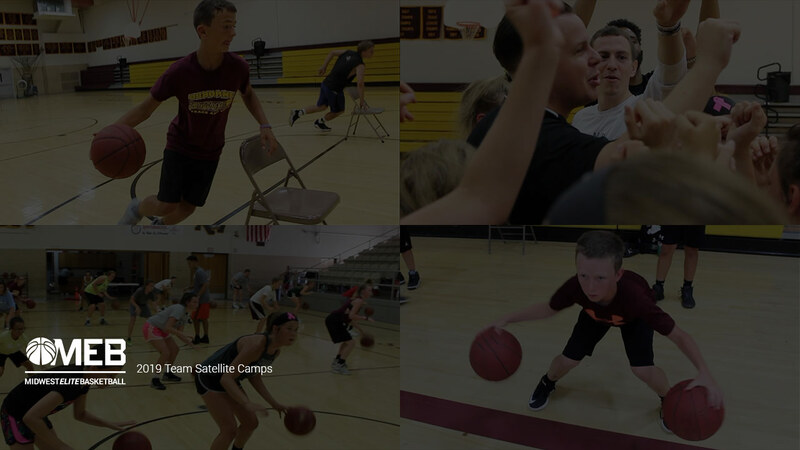 6 MEB camps build excitement in each program we work with. High school athletes like it when college coaches attend their games during the season. High school athletes LOVE it when college coaches come to their gym to work with them. They are incredibly receptive to the instruction because they are in the comfort of their own gym, they are hearing a different voice, and they are ambitious to work hard each and every minute of camp because college coaches are in the gym. Midwest Elite Basketball provides the best in off-season player development. To register for a camp please contact us and let us know what camp dates you are interested in. We market to and primarily work in the 12-state Midwest Region, however, we are willing to travel our college coaches anywhere in the country. We look forward to hearing from you and answering any questions you may have.